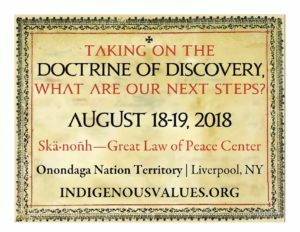 Attending the conference on the Doctrine of Discovery, provided an opportunity to deepen our collective understanding of these edicts, which are based on the Papal Bulls issued by the Catholic Church in the fifteenth century. I find that I always have to start at the beginning in discussing this because knowledge of the Papal Bulls and the Doctrine of Christian Discovery are not a part of our American conversation regarding the ills of our society. They should be, as they are directly relevant to our hierarchical structure; these edicts determine who rules and who is subjugated. We are constantly thinking, talking, acting in a vacuum, not knowing how our society was formed. Those who are activists struggle with gaining a foot hold into making change, without ever knowing how we got here in the first place. My constant thoughts are why do these failing ideals of freedom continue in the land of the free and the home of the brave? Why are me and mine left out of the picture of prosperity when my ancestors’ enslavement actually built this country’s wealth? And my other ancestors were the first and only ones here before the age of discovery, but now, are dispersed, landless and drained of our language, history and culture? Why do we continue to be a part of the vulnerable masses who could lose everything and actually have nothing? Many of us do not /cannot claim who we are for fear of social retaliation. We have been told to remain separate from ourselves. That, of course, has been to our detriment. The directive given in the first such Papal Bull, Dum Diversas, in 1452 to King Alphonse of Portugal by Pope Nicholas was to go into west Africa and: Invade, capture, subdue, and vanquish all pagans, Sarsens and enemies of Christ. They were to be put into perpetual enslavement with their lands land and possessions given to the Crown. Thus, began the colonization of Africa, and the enslavement of Africans, forty year before Columbus, so we can see why he felt so disposed to enslaving the indigenous peoples of the Caribbean islands.These “marching orders” would leach into the mindset of European monarchs, who using the Papal bulls as a base, who moved onto non-Christian lands and claimed them for their own. In our United States, Thomas Jefferson, declares in his Notes of the State of Virginia, that the “infant United States” follows the lead of Christian European nations in exercising the actions directed in the Doctrine of Christian Discovery. I find this particularly interesting that the author of our constitution, a proponent of our liberty from England, proposed that this infant nation take the example of subjugating nations to dominate sovereign peoples. This Doctrine lives throughout our laws, particularly in our claim to indigenous lands, even the claim that these lands are vacant of people- as the people are not Christian and therefore, not white. Other foils are used to perpetuate the charge of a righteous cause. The bible is used – particularly Genesis – to emphasize our right to have dominion over the land. Exodus is used to justify taking land belonging to other people and claiming the “promised land” for one’s own. These orders have been used to severe sovereign nations from their land, giving them only the right to occupancy and not the right to ownership over resources of their ancestral lands. As far back as Johnson v. McIntosh,1823, (“that principle of discovery gave European nations an absolute right to New World lands.”) and as recent as Ruth Bader Ginsberg v Oneida, 2004, specifically citing Genesis, everything for the Doctrine of Discovery to the creation story has been used to justify the US taking resources from other sovereign nations. Manifest Destiny was desired by George Washington and put into action with each administration, until finally, non-white people are removed through genocide, from their land. As laws serve to govern and build this nation, attitudes serve to support the leanings of the government, in order to justify these actions. These things would not and could not take place without the consent of the governed. What would justify taking land away from people? What would justify genocide of people? You first have to believe that these are not actually people or that they are somehow less than you and not worthy as you are. The thinking and actions which created the Papal Bulls of Dum Diversas as carefully fed to the populace. They worked hard to teach the populace that “the only good Indian was a dead Indian”, that this country should be blessed for “sea to shining sea.”, and if they were poor, “at least they were not Black”. They were to be a part of carrying out these edicts, these marching orders of the monarchs of Europe and the faithful of the church. industry, our people succumb to cancer and die. Today as we walk into stores to be served, we know we are not welcomed. We are demonized in our character and our culture. The country still does not find it offensive to use caricatures of us as a symbol of their football team. It is as though we are dead, just as society has orchestrated. But we are here and we are not going anywhere. It is time for a change. It is time for white Americans to realize that our way is the way to renew the earth that has been damaged through industrialization and pollution to our planet. As we move forward and expect for Rome to rescind the Papal Bulls, we ask our allies, have you, can you reflect on the attitudes, biases you hold which emanate for these same papal bulls? It would be ludicrous to think that these ideologies which permeate every aspect of our life in this country does not affect our relationships with diverse communities. The United States is a segregated society, this makes it difficult for individuals to hear and acknowledge those outside of their usual sphere. Micro aggressions abound. What in our conversations and /or actions dominate? What can we do to rescind our habits, turn the tide and become more respectful of others? We have to let go of our prejudices, our fears, our sometimes invasive and insulting remarks about our hair, skin, or clothing, or having to justify our right to our homes, job and /or positions, which many POC find offensive. We have to acknowledge that POC want to have conversations regarding race relations as we live the negative impacts almost daily. Whites will ask, “Why are we still talking about this? Aren’t we over this?” or say, “I am not responsible for this”, despite benefitting for it. It is not merely truth and reconciliation; we have to prime ourselves for actualizing a change in the power dynamic. If we are ever to live up to this country’s creed of liberty and justice for all, then we must begin this work. The time is now. Let us rescind the Doctrine of Christian Discovery which we have internalized. Our next step is to talk about equality, what it really looks like, what it really sounds like, then act to make it so.